I love giving stuff away. 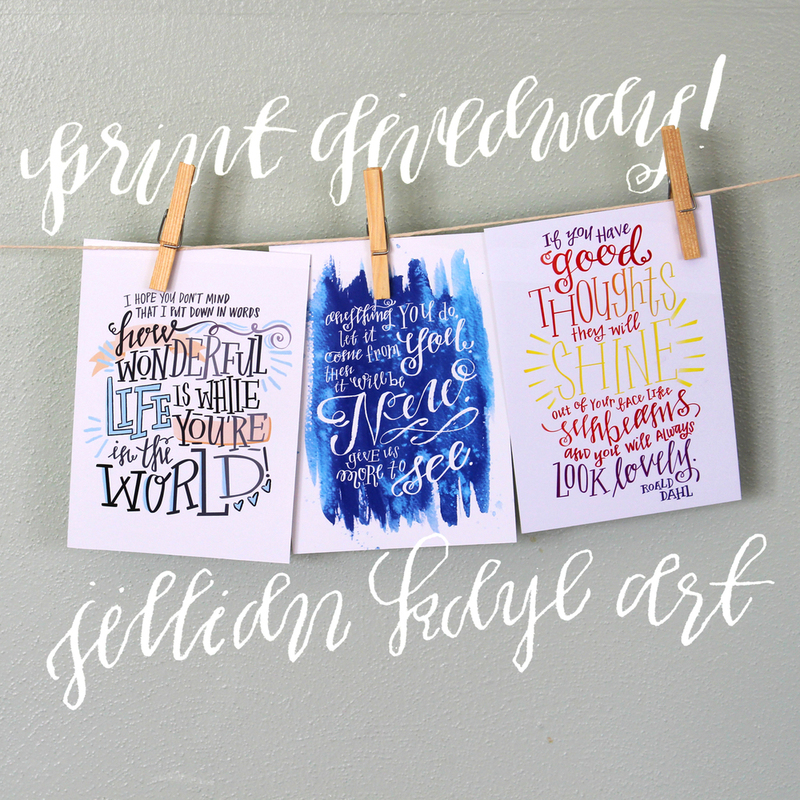 This week I am giving away two Encouragement Print Packs! I bundled three of my favorite prints together because they're encouraging to me; they're hopeful, powerful, and uplifting. For my print giveaway, all you have to do is tag a friend that encourages you or that may need encouragement. I love reading all the sweet notes people write to the friends they tag. It brings me joy. I'll randomly draw a name on Friday, February 27, and you'll both win a set of prints each. This contest is only available on Instagram so please enter there! And if you don't want to leave it to chance, you can get an Encouragement Print Pack for yourself in my Print Shop! Your prints will arrive in a fancy, hand-lettered envelope - if that sweetens the deal, amigos. Jacob and I got a dog. His name is Quigley and he's three pounds, 11 weeks, and 50% ears. We've had him for just under two weeks and he is a handful. Sometimes I feel like I bit off more than I can chew but, darnit, he sure is fun. He loves playing tug-of-war, cuddling, and chewing on everything he can find. He knows his name and is almost house trained. Considering we got him in the dead of winter and several inches of snow were dumped on us while we were trying to teach him to go OUTSIDE in that mess of weather, we're proud of him. Speaking of weddings, Michelle Ross is an excellent photographer. She photographed our wedding, as well as the weddings & family portraits of many of my friends. I swear, every image is fantastic. Michelle asked for a lettering logo, which was a departure from the slim, sans-serif stacked type she had before. I dig both styles. I'm also a big fan of circular logos. Do you need a circular logo? I can do that. My friend Katie is a fantastic wedding coordinator. She's the one to entrust your big day to so all you have to concern yourself about is I Do. She makes sure everything goes smoothly during your ceremony so you don't have to. Check out her site for more information, to purchase super-hepful planning documents or to enlist Katie for your wedding day. I love making letter-centric logos. I used a simple watercolor to add texture and a dreamy air to her logo. Matt Stephens is a worship leader at my church and a member of a '90s cover band called The Lone Rangers. They're at Dorsett Inn this Friday night and they're awesome. If you have any attachment to the 1990s, you'll enjoy it. Matt writes some really wonderful worship songs and asked me to create a lettering piece of one of his lyrics. The image to the right is the sketch - the actual thing is 4x5 ft and I'm still working on it. I'll post a pic on my Instagram when it's complete! So head on over to my feed and enter the contest! I'd love to send you some prints.